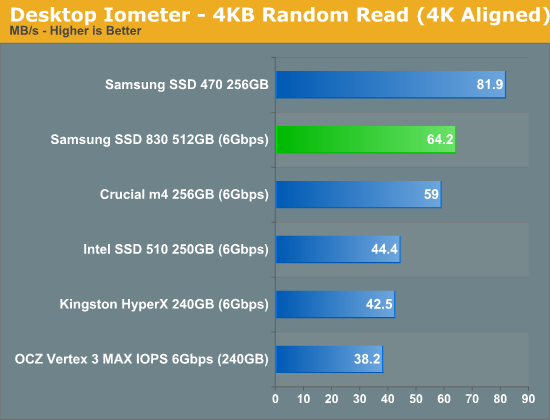 The four corners of SSD performance are as follows: random read, random write, sequential read and sequential write speed. Random accesses are generally small in size, while sequential accesses tend to be larger and thus we have the four Iometer tests we use in all of our reviews. Our first test writes 4KB in a completely random pattern over an 8GB space of the drive to simulate the sort of random access that you'd see on an OS drive (even this is more stressful than a normal desktop user would see). I perform three concurrent IOs and run the test for 3 minutes. The results reported are in average MB/s over the entire time. We use both standard pseudo randomly generated data for each write as well as fully random data to show you both the maximum and minimum performance offered by SandForce based drives in these tests. The average performance of SF drives will likely be somewhere in between the two values for each drive you see in the graphs. For an understanding of why this matters, read our original SandForce article. Just as we saw in Crucial's move to the m4 it looks like random read speed actually dropped a bit between the SSD 470 and 830. 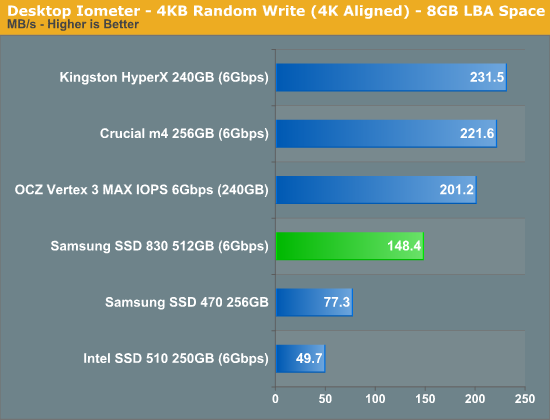 And just as we mentioned before, most desktop workloads don't demand super high 4KB random read performance so if this move was done to improve the 830's behavior elsewhere then it is a worthwhile tradeoff. Even with the drop however the 830 delivers the fastest 4KB random read performance of any high-end drive we've reviewed. Random write performance has improved tremendously, although it's still noticeably slower than the SF-2281 drives and Crucial's m4. Similar to 4KB random read performance, there are diminishing returns beyond a certain level. Intel tends to have the right idea in how best to deal with random writes: work slower but clean up along the way, vs. write as fast as possible and rely on TRIM/idle garbage collection to improve performance later on. I've become wary whenever I see ultra high 4KB random write performance because it usually means that fragmentation can be a problem over time. SandForce's numbers are high here because the workload is easily compressible, which is usually the case for desktop random writes as they tend to be table updates. To measure sequential performance I ran a 1 minute long 128KB sequential test over the entire span of the drive at a queue depth of 1. The results reported are in average MB/s over the entire test length. Although there are diminishing returns for ultra high random read/write operations on a desktop system, large sequential reads still scale quite well. If you do any amount of large file copying from your SSD to another SSD or file server you'll want to pay attention to these numbers here. 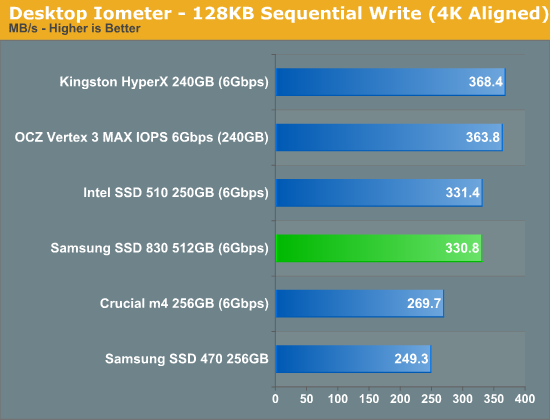 Samsung manages to dethrone Intel at the top of our charts here with a very respectable 411.5MB/s. Sequential write speed is also still very important, again for those large file transfers. Despite the importance of random read/write IO the majority of desktop access patterns are still governed by sequential throughput. 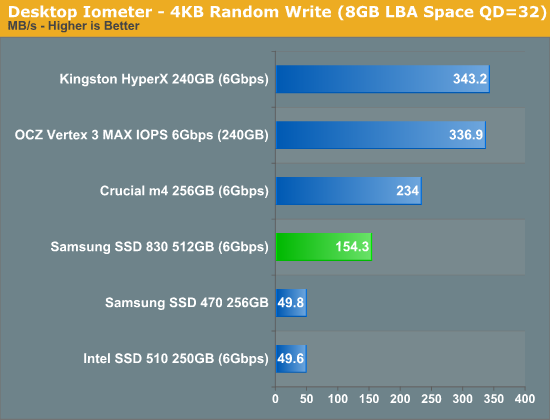 For an SSD to truly excel it needs good performance in all four of these categories. 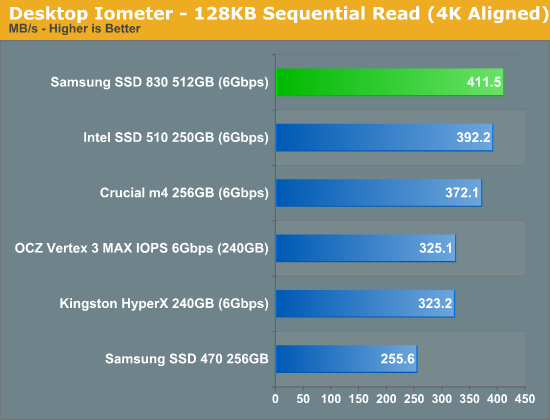 Thankfully for Samsung's sake, the SSD 830 delivers.